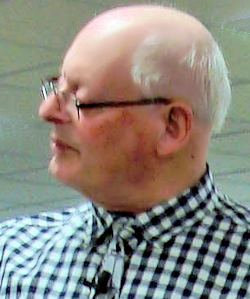 Members each brought along two paintings for appraisal by Guild of Aviation Artist Peter Sumpter. Peter joined the Leicester Sketch Club in 1955 and in 1958, was accepted by the Leicester Society of Artists. Before making any comment on our paintings, Peter told us that he found it so enjoyable to see other people's work. 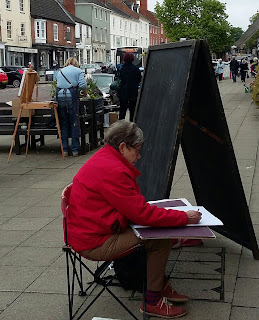 Drawing on his considerable experience and expertise, not only was he quick to point out successful parts of a painting, he also gave lots of advice on how a painting could be improved by a few simple additions or alterations, even cropping down works to aid composition. To check if an ellipse is symmetrical, turn the work at right angles and tilt until an ellipse looks like a circle - a true circle would mean a true ellipse. Take some parts of the work - like a tree for example, out of the frame, again to aid composition. The same advice was given to a member who brought along her painting of an elephant, only this time to take the trunk (which was near the bottom of the work) out of the bottom of the frame. If more than one tree etc. in a painting, make one of them appear dominant rather than all even sized. Peter also brought along some of his sketchbooks. These were fabulous to look through, the drawings also being incredibly neat! A joint venture! 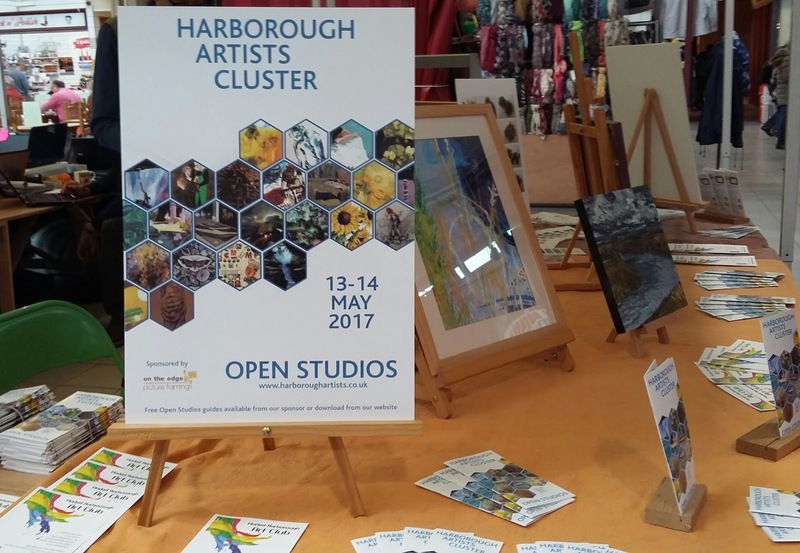 Market Harborough Art Club (MHAC) and Harborough Artist Cluster (HAC) help each other. 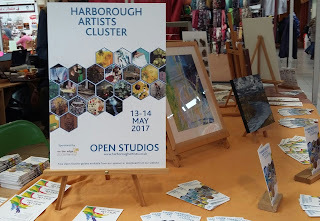 Last weekend the HAC & MHAC took to the streets and the local market to advertise the HAC Open Studios and MHAC.